This is a piece I did for Appliance Retailer earlier on the year. It ought to be useful for people who are totally lost when it comes to making the necessary adjustments to their home theatre receivers. Go here. A couple of years ago Sydney-based Lake Technology developed audio processing algorithms and hardware to make headphones sound like they're producing surround sound. The success of this enterprise is attested to by the fact it was was duly licensed by Dolby Laboratories as Dolby Headphone. All this is done in the digital domain. Of course, it works at line level, with 96kHz/24 bit analogue to digital converters and 192kHz/24 bit digital to analogue. Or you can feed a PCM signal directly into it to skip the first A/D conversion. The DSPs that do all the heavy EQ and phase manipulation and crossing over work with 32 bits of resolution. You can either have the unit set up for you by installers, or get the calibration kit which includes Windows 2000/XP software and a calibration microphone. The reviews quoted on the company's Web site are extremely positive, and the whole concept is very appealing to me. Those speaker makers committed to the highest quality have to go to herioc lengths to reconcile the often contradictory demands in crossover design: smooth frequency response, minimal phase distortion, steep filter slopes, even impedance across the audio spectrum. One or more of these goals always suffers. Where did the expertise for all this come from? Today I had a chat on the phone to DEQX CEO Kim Ryrie. Turns out that he was also the man behind the famed Fairlight Computer Musical Instrument back in the mid-70s. It's also worth noting that the DEQX system (previously known as ClarityEQ) has been installed in such recording studios as Abbey Road. Basic prices start at somewhere in the $AUS4,000 to $5,000 region. Precalibration for rooms on supplied detailed specification, using acoustic modelling, comes to around $US900. But you can make do with the internal parametric equaliser to make the necessary adjustments if you like. I've seen them in people's homes. I've seen them in a multitude of shops. I've seen them, incredibly, at product launches by major home entertainment equipment manufacturers. And now, once again, I've seen one in Iraq, courtesy of CNN. What I keep seeing is fat faces. First, I must accept that discussing the issue in this entry in this context is probably inappropriate given the gravity of what has been achieved by the Coalition Provision Authority in Iraq with the capture of Saddam Hussein. I had a tear in my eye with the joy of the moment as I was watching the press conference last night in which the announcement was made. But the fact that these pictures are, more likely than just about any other, to be seen internationally make them a fitting example of this widespread (and, in the great scheme of things, trivial) problem. The problem is that once some people have a widescreen display (ie. with an aspect ratio of 16:9 instead of the standard 4:3), they seem to live in fear of ever having black bars down the sides of the picture. Instead, they leave the display in 16:9 mode, stretching material recorded in 4:3 mode sideways. In those welcome, and pleasingly demeaning, shots of Hussein shown on plasma displays in the press conference, this attitude was in clear evidence. It was obvious that the video footage of the butcher was shot using a 4:3 aspect video camera. But the widescreen plasma displays were left set to widescreen mode, so Hussein's whole image was distorted sideways, stretched by 33% horizontally. The first picture here shows my scan of the picture from the front page of today's The Canberra Times, and no doubt similar shots appear on front pages around the world. This is a straight screen capture from the video feed, seemingly not changed in any way other than being cropped at the edges. The second picture here shows the same scan, but reduced in horizontal scale by 25% to adjust for the 4:3 to 16:9 widening to which the original picture was subject. 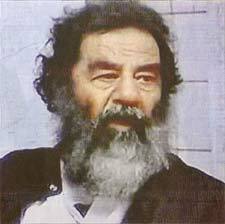 Now, I ask you, which one looks more like Hussein? What is interesting is that the distorted image is still recognisably Hussein. The image processing and facial recognition circuitry in the human brain is truly an amazing thing. A Samsung DVD-HD938 DVD player turned up today (with confusing model numbers, it seems to be variously known as DVD-HD938, DVD-HD937 and DVD-HD935). This is significant in two ways. Apparently the price is going to be quite low (I believe that it'll be under $AUS1,000, but will advise when the official price comes through) and it features a DVI output. The actual socket is a DVI-I but apparently the thing is wired to support just DVI-D (see here for what these mean). Which is fine. No, which is flippin' amazing! I've been using the $AUS3,000 Marantz DV8400 recently for DVI. The Denon DVD-A11 costs $AUS4,000. Okay, I haven't wired this one up yet, but already I'm excited. Shortly I'll be placing here some remarks on the actual effect of a DVI connection compared with component video, but one important point about it is that performance depends very much on the quality of the deinterlacing electronics in the DVD player. And here's the reason for the excitement: notice the left-most logo on the photo herewith? Yep, Faroudja DCDi. Samsung hasn't skimped here. Of course I'll check this out to see if my theorising is correct. On reflection, though, the 720p mode could useful because Samsung also sent down one of its new LCD RPTVs, the SP-46L5H (a 46 inch widescreen model). This uses 1,280 by 720 pixel panels and features a DVI input. Consequently it ought to match the 720p output mode rather well. Interestingly, this appears to use Samsung's own scaling and de-interlacing circuitry rather than Faroudja's, so I ought to be able to compare the quality of the two. UPDATE (Friday, 5 December 2003, 4:59 pm): Samsung's PR firm tells me that this DVD player will be available in Australia in February 2004, and the recommended retail price will be a very attractive $AUS599. UPDATE 2 (Friday, 5 December 2003, 5:01 pm): Vincent from Perth writes to suggest that I might have been a bit harsh on the whole scaling, then re-scaling thing. Could be. He points out that his Epson projector uses 1,280 by 720 LCD panels and so could take excellent advantage of the 720p mode. He further points out that many projectors have a 'through' mode which could also be suitable. And he's quite right. I'd kind of forgotten about the through mode because with analogue connections, most 'through' modes on projectors assume a 4:3 aspect ratio, whereas I usually want 16:9. (An exception has been the various Sony home theatre projectors which have through-wide and through-normal modes). The 'through' mode, by the way, eliminates the vertical scaler. Each input line is simply translated into an output line from the projector. The horizontal scaler is still used, normally, because an analogue signal can be any width. However if fed a 1,280 by 720 digital signal (which is what 720p is) than there should be no horizontal scaling either. This is true only in the case of material sourced from a progressive scan video recorder. It is not true with film-sourced movies. These are filmed at 24 frames per second. Progressive scan transmission at 50 hertz involves repeating every single telecined line twice. It's a bit more complicated in 60 hertz countries since each line is shown 2.5 times. The 'resolution' in the sense of the amount of data carried by a progressive scan system is higher than the interlaced version, for sure. But the 'resolution' as used in common parlance -- the amount of picture detail you see on screen -- is, in the case of film sourced material (ie. virtually all movies), identical in the progressive scan and interlaced versions. It's just that the progressive scan version carries a huge amount of redundancy. 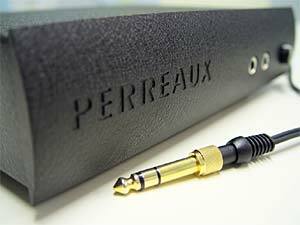 New Zealand audiophile electronics maker Perreaux publishes an occasional electronic newsletter to around 3,000 people around the world. I couldn't find an archive of the newsletter at Perreaux's Web site, but it's easy to sign up on the home page. It doesn't just boast about its own products, but includes some useful tips for the listener and recommends a few CDs best enjoyed through high quality gear. The latest edition of Australian Hi Fi magazine (Oct/Nov 2003) is out now and contains a well written article on the new Silhouette series SXH1 headphone amplifier. Reviewer, Stephen Dawsons', strong emphasis on a measurement based review process is refreshing. Please open the attached link [197kB PDF -- SCD] to read his well structured review. To find out more about the SXH1 product please click on the attached link. Do you like factual reviews? Writer Stephen Dawson is one of Australia's leading freelance writers on home entertainment equipment: high fidelity, home theatre, the equipment required, and the software that it uses. I highly recommend his informative, no nonsense website. I'm glad you liked the review, but the way I see it is that the review was good because the SHX1 is good.